Everything goes into the food processor and purees until smooth and that’s it! Just serve with an array of your favorite colorful vegetables. Some raw, some blanched. It’s quite impressive to serve to your guests. This recipe makes about 2 Cups and we estimated about 2-1/2 Tbl per person. So it serves approximately 12 people. 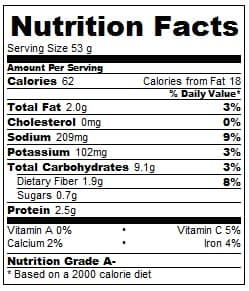 You can adjust it up or down as you wish, but this is how the nutrtion was calculated. Lightly coat with vegetable oil and salt. Roast until fork tender, about 45 minutes to an hour depending on size. With GLOVES or a PAPER TOWEL, remove skin. It will stain your skin red if you aren't careful. Place into a food processor with all other ingredients. Serve with a colorful array of mixed vegetables. I can’t wait to try this! 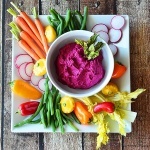 I love roasted beets, but I never thought to make hummus with them. Genius idea! Have you tried this with raw beets? Just curious. I haven’t tried this with raw beets. Sounds interesting though! This was DELICIOUS!! Roasting it definitely made it sweeter; everyone was so surprised when I told them no sugar was involved!! But question. Would I get the same creamy, dry, and sweet consistency if I use canned beets? Hi Connie, I am so glad you and your family liked it! 🙂 I think that the creamy, dry consistency comes more from the chickpeas. You could use canned beets (without the liquid, of course), but I think you might lose that sweetness that roasting them provides. The roasting brings out the natural sugars and I am not sure how canned beets are prepared prior to canning, but I certainly think its worth a try! If you do, I would love to hear back from you. For sure!! I do have a can of beets in my kitchen cabinet but I wanted to follow your recipe 100% so perhaps I will experiment next time and let you know! !